Pub in Putney, and CAMRA's Greater London Pub of the Year 2007 and 2009. They have ten handpulls on the bar, and serve the full range of Timothy Taylor beers. In the past we've found the Tim Taylor Dark Mild very drinkable, and on a March 2009 visit, the Ram Tam was particularly nice. One notable guest on our January 2008 visit was Downton Chocolate Orange stout — very tasty. There is normally one real cider available on a hand pump. 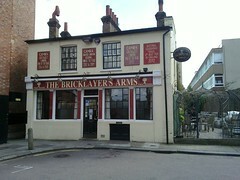 As of March 2009, the real ales are £3/pint. They really care about their beer here. On our January 2008 visit, the barman poured an entire pint down the sink because he thought it looked a bit cloudy. As of June 2013 they don't do any food, though at beer festivals they normally have some Cornish pasties. The decor is quite basic and functional, but in a good way. There's a large table at the front which is good for bigger groups. They have a proper open fire, and a bar skittles set. There is a largish paved beer garden at the side of the pub photo. The men's toilets are very small. Last visited by bob, February 2014. Opening hours taken from the Bricklayer's Arms website, April 2017. Last edited 2019-01-17 10:33:52 (version 61; diff). List all versions. Page last edited 2019-01-17 10:33:52 (version 61).